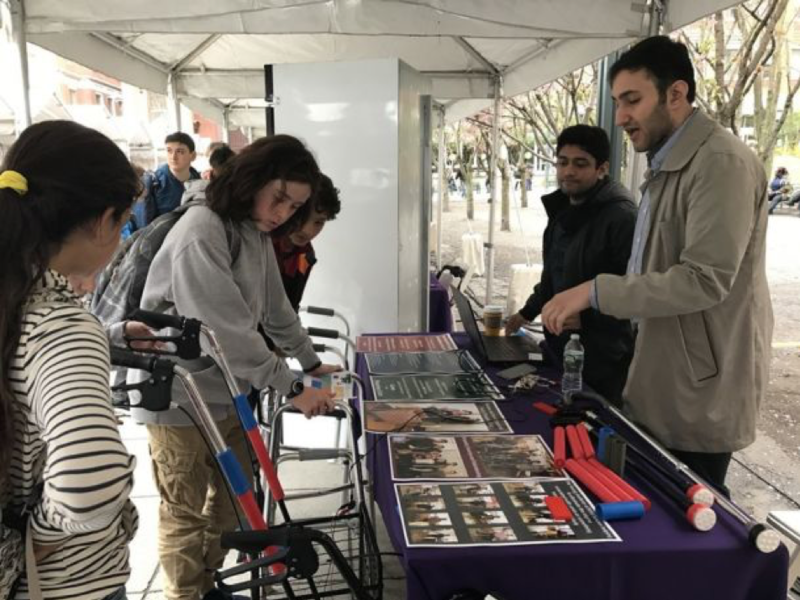 From innovative smartphone apps for healthcare to data-driven models for New York City’s transportation planners, there were almost 70 teams of scientists, engineers, and technologists displaying their work at the NYU Tandon School of Engineering’s 2017 Research Expo. 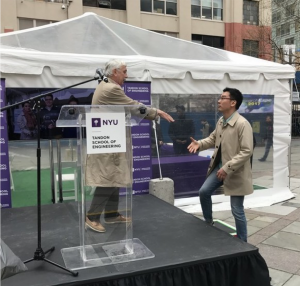 The annual event drew government officials, fellow researchers, public school students and teachers, and scores of Brooklynites who found themselves attracted to the sea of tents putting the Tech into the MetroTech Commons. 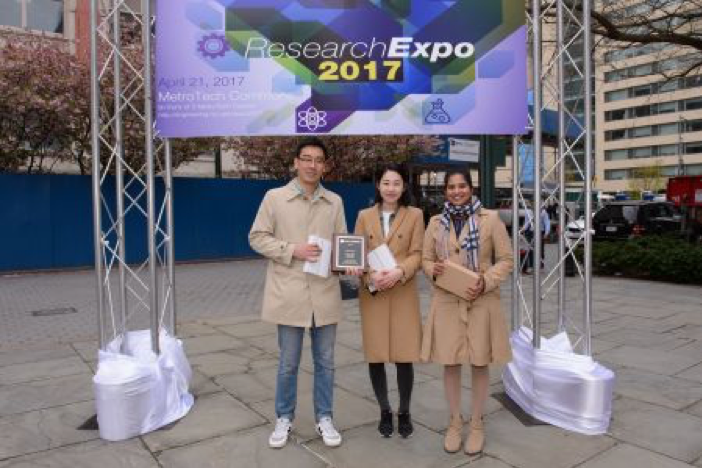 Sungmin Hong (left) and Heejong Kim (center), doctoral candidates in computer science and engineering, won first place for their research into 4D brain shape modeling. Yamuna Krishnamurthy (right), a research associate in ViDA Lab accepting for DARPA’s Memex project, which won third place for developing online search tools that mine the dark web to combat human trafficking. Among the work on display was a project by students Shane Carberry Mogan, Damon Chen, and Cyril Bernardo (and overseen by Professors of Mechanical and Aerospace Engineering Angelo Tafuni and Iskender Sahin), who are assisting NASA in the development of an autonomous submarine that will navigate the liquid hydrocarbon seas of Saturn’s largest moon, Titan. Using their expertise in Computational Fluid Dynamics (CFD), they are advising the space agency on submarine design modifications, navigation techniques, and ideal locations and depths for conducting research. CFD analysis allows NASA engineers to run cost-efficient, time-sensitive simulations of various scenarios, meaning that scientists may soon have a greater understanding of Titan — important because many of its morphologic features are analogous to those of Earth. 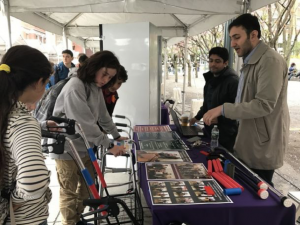 In addition to planetary bodies, the human body was the focus of much of the research being shown at the Expo, including a novel way to deliver therapeutic agents via hydrogels and a way of stopping premature labor via an implantable electronic device. Professor Guido Gerig, who chairs the Department of Computer Science and Engineering, is innovating the field of brain imaging, working with students Heejong Kim and Sungmin Hong to create 4D modeling techniques that will allow clinicians to better monitor disease progression, the efficacy of therapeutic interventions, and rehabilitation efforts for those suffering traumatic brain injury, autism, and Huntington’s disease, among other conditions. Such 4D modeling is essential to understanding the complex dynamics of pathologies, and it enables invaluable analysis of structural pathology and brain connectivity. 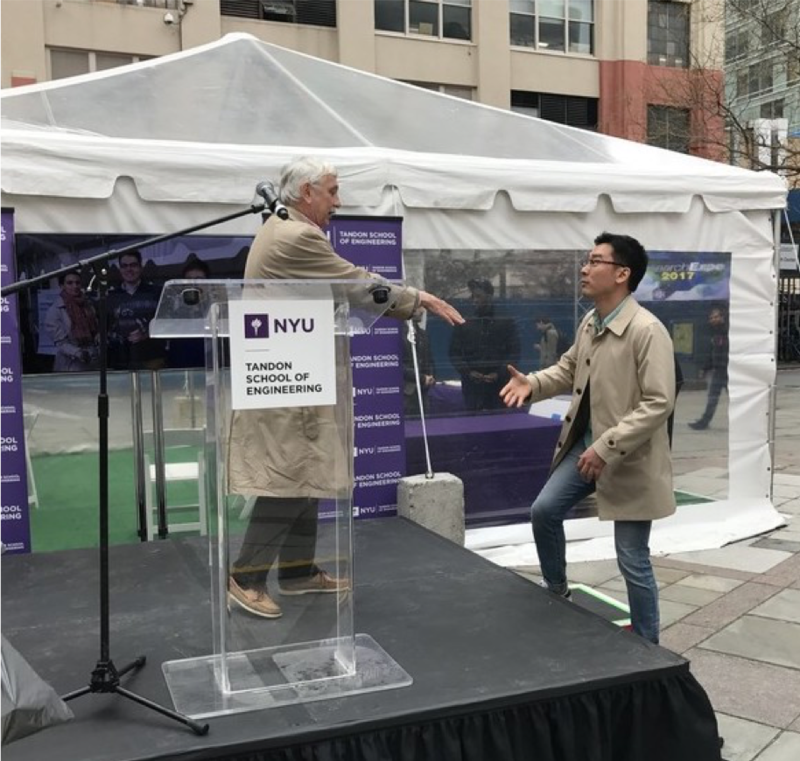 Taking second place was Roozbeh Soleymani, a doctoral candidate in electrical engineering who created an innovative algorithmic noise-reduction technologycalled SEDA (Speech Enhancement using Decomposition Approach). SEDA breaks down a speech signal into waveforms that differ not just in frequency (the number of oscillations per second) but in how many oscillations each wave contains, thereby allowing users of cochlear implants and hearing aids to better discern what someone is saying to them in a sometimes cacophonous sea of ambient noise. For third place, judges recognized a project spearheaded by Professor of Computer Science and Engineering Juliana Freire, who worked with studentsYamuna Krishnamurthy, Sonia Castelo Quispe, Aecio Santos, Kien Pham, and Jorge Piazentin Ono on the U.S. Defense Advanced Research Projects Agency (DARPA)’s Memex program, to develop methods of locating and exploring hard-to-find information on the deep web — the parts of the web not indexed by standard commercial search engines. Memex is aimed, initially, at addressing a key Defense Department mission — fighting human trafficking — but will be used eventually to find difficult-to-discover information on any portion of the web. Visitors to the Expo also had a chance to meet teams getting ready to compete in a variety of challenges, including the NASA Robotic Mining Competition, which calls upon students to design and build a robot capable of navigating and excavating the rugged terrain of Mars; the Society of Automotive Engineers (SAE) Baja event, which requires students to design and build race-worthy off-road vehicles under a strict set of parameters; the Aero Design Competition, which challenges engineering students to conceive, design, fabricate, and test a radio-controlled aircraft that can take off and land while carrying the maximum cargo; and SpaceX Hyperloop competition, for which the team built a pod meant to speed freight, and eventually passengers, at more than 700 miles an hour through a visionary transportation system conceived by Elon Musk. 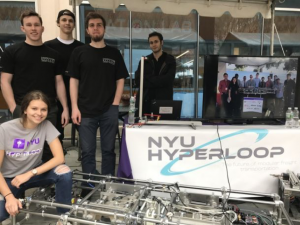 Alongside them were competitors of another type: entrepreneurial teams taking part in NYU’s InnoVention Competition were in attendance, as well. Add to the mix a selection of student capstone projects and exhibits from the school’s innovative Vertically Integrated Projects program, which allows students to contribute to a large-scale undertaking throughout multiple semesters, and a full panoply of Tandon achievement was on display.